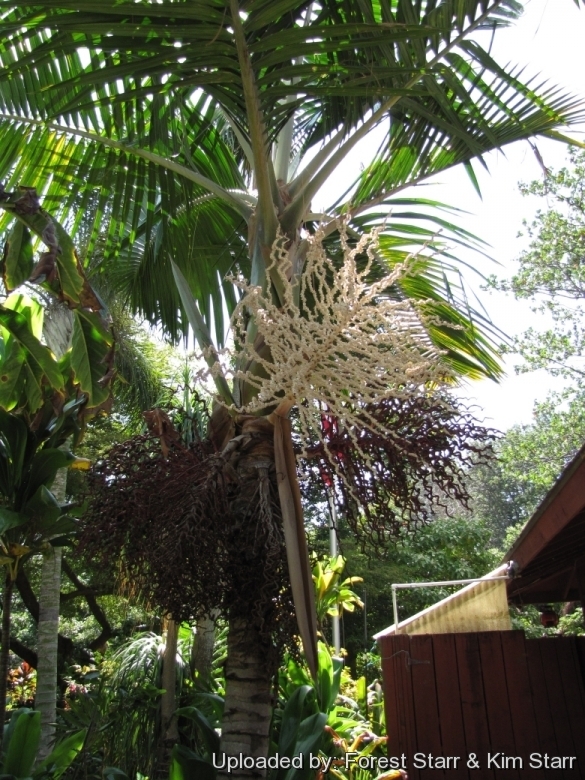 Habit with zigzag flower stalk at Iao Tropical Gardens of Maui, Maui, Hawaii (USA). May 22, 2012. Altitude range: Antillean populations occur at lower elevations, usually below 1000 m.
Habitat amd ecology: It is often a conspicuous component of montane forests along creeks and on steep mountainsides. The fruit of Prestoea acuminata var. montana is the favorite food of the Puerto Rican parrot. Euterpe andicola Brongn. ex Mart. Euterpe haenkeana Brongn. ex Mart. Euterpe manaele (Mart.) Griseb. & H.Wendl. Oenocarpus glaucus Lodd. ex H.Wendl. Prestoea trichoclada (Burret) Balslev & A.J.Hend. Prestoea dasystachys (Burret) R.Bernal, Galeano & A.J.Hend. Description: Prestoea acuminata var. montana is a single stemmed Antillean form of the usually suckering Prestoea acuminata, and is best known in cultivation as Prestoea montana. 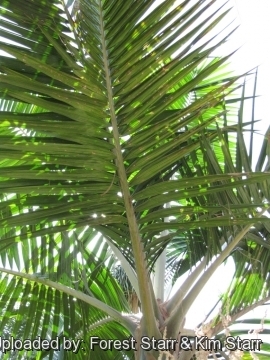 It is a tall palm with a thin trunk and an uniform diameter reaching heights of up to 8 (or more) m tall. The Antilleam populations are more homogeneous than those from the mainland. Distinguishing characteristics: It has cylindrical rachillae (not angular) which are almost glabrous or rarely with a few crustose hairs. Inflorescences are more corymbose than those from mainland populations, and triads are superficial on the rachillae. It also has slightly larger fruits. Stem (trunk) Thick, erect or slightly leaning, green amd white ringed about 25 cm across. Often with a cone of adventitious roots visible at the base. Crownshaft; Sheath closed for about half length and forming a partial green through to reddish through to purplish black, large and decorative. Leaves: 4-10 per crown, pinnate, dark green approx 2.0-2.5m long, and held in a fairly upright manner. Petiole 0-60 cm long hairy. Rachis 0.6-2.6 m long, with tomentum like that of petiole. Pinnae 30-60 per side, regularly spaced and stiffly spreading in the same horizontal plane, coriaceous, with prominent midvein and with several prominent lateral veins. Inflorescences: Corymbose below the leaves. Peduncle 3-20 cm long. Rachis 17-85 cm long. Rachillae 23-117, 18-74 cm long , to 6 mm in diameter. Flowers: In triads. Staminate flowers 4-6 mm long, either sessile or on short, flattened pedicels. Pistillate flowers 2.5-4 mm long. Fruits: Globose, rarely ovoid or obovoid, purple-black minutely tuberculate 1-1.8 cm in diameter, the stigmatic remains lateral. Seeds: Globose, 0.8-1.4 cm in diameter. Seedling: Eophyll (seedling leaves) tip bifid (divided). Prestoea acuminata (Willd.) H.E.Moore: has angular rachillae with hairs (Rarely glabrous). Inflorescences are more elongate, and triads are slightly sunken in the rachillae. Distribution: Central and South America usually occur above 1000 m.
Prestoea acuminata var. dasystachys (Burret) A.J.Hend. & Galeano: has very large, almost ellipsoid fruits, with large, persistent perianths. Distribution: grows at high elevations (above 1000 m) in the northeastern Andes. Prestoea acuminata var. montana (Graham) A.J.Hend. & Galeano: has almost glabrous, cylindrical rachillae, more corymbose inflorescences and triads are superficial on the rachillae. Fruits are slightly larger. 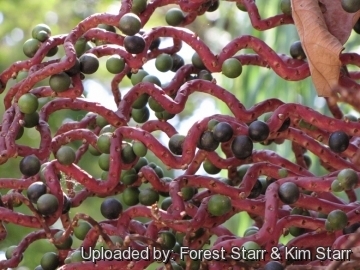 Distribution: Antilles usually below 1000 m.
1) Forest & Kim Starr Prestoea acuminata var. montana (Mountain cabbage palm). Plants of Hawaii. <http://www.starrenvironmental.com>. Downloaded on 31 August 2014. 4) Gloria Galeano and A. Henderson. “Flora Neotropica.” New York Botanical Garden. 5) Van den Eynden, V., E. Cueva, and O. Cabrera, “Edible palms of Southern Ecuador.” 2004. Cultivation and Propagation: Prestoea acuminata var. montana is an excellent relatively fast-growing garden plant adapt to humid tropical or subtropical climates. It is also a durable indoor palms. Soils: It likes rich, very well drained soil. Watering: It prefers regular waterings and should be watered before the soil completely dries. This palm a will tolerate occasional dryness if not prolonged. Don't let sit in water. Indoor, potted plants should not be over-watered. They may contract the fungus Phytophthora, if over-watered. Light: Outside they usually prefers some shade unless the humidity is very high and tolerating direct sun only after about five years old. Young specimens need protection from direct sunlight and grow best in shady to partly shady locations. If home-grown, they look their best in bright diffuse light but tolerate very low light levels. Hardiness: They grow well in tropical and subtropical climates but will also grow in a cooler climate, and mature, established specimens can tolerate light frosts, but only for a few hours; normal temperatures should not go below 10°. (USDA Zones 9B – 11). Wind hardiness: It cannot tolerate sweltering heat and windy conditions. They need overhead protection from hot sun and winds. Use: It is grown in open air, in the sub tropical and warm-temperate zones, for the decoration of parks and gardens, in a partly shaded location when young, and regularly watered. Traditional uses: Thatching. In addition, its vegetating buds are often used as palm cabbage.